In most car accidents in Queens, it is possible for the injured person to recover compensation from the liable party’s insurance provider. However, when the at-fault driver is uninsured or underinsured, the injured person must pursue compensation from his or her own uninsured/underinsured coverage. 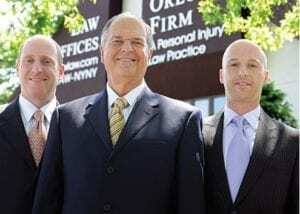 At The Orlow Firm, our attorneys have extensive experience handling car accident cases and are knowledgeable in the complex insurance issues that come into play. We will use our experience, skill and resources to pursue maximum compensation for your car accident injury case. Contact our New York City law firm today to speak with an experienced Queens uninsured motorist coverage attorney. If you have been injured by an uninsured driver, you may pursue compensation from your own, first party, uninsured motorist coverage. Your insurance company, however, may try to limit, delay or deny the coverage you are entitled to. This is why it is important to have an experienced personal injury attorney protecting your rights. Our lawyers deal with insurance companies every day and have the skill and resources to determine the true value of your claim. We will pursue all avenues of compensation to help you obtain the financial resources you need to pay for your medical expenses and other hardships. If you are hurt in a car accident, the driver who caused the accident usually has automobile insurance that helps to pay for your injuries and expenses. But sometimes the driver who is to blame for the accident has no automobile insurance coverage. When this happens, you must try to get your own insurance company to pay for your damages out of your automobile insurance coverage. This is not always easy because your insurance company might deny your request for payment even though you are entitled to it. Or, your insurance company might take a long time to pay you or pay too little to cover the amount of your damages. This why it is important for you to have a personal injury attorney who knows how to help you get what you deserve from your insurance company. Sometimes, if you are hurt in a car accident, the driver who caused the accident might not have enough automobile insurance to pay for all of your injuries and expenses. In such a case, your underinsured motorist coverage might be used to help you make up the difference. For example, if you suffered $200,000 in damages and the driver who was to blame is only insured for $50,000 you can try to get the missing $150,000 from your own underinsured motorist coverage. It is important that you buy extra underinsured motorist protection when you purchase your automobile insurance policy. You would be surprised at how little it costs and how helpful it can be when you need it. If you are hurt in a car accident, and the accident was caused by your husband or wife, can you sue your spouse for the damages he or she caused? In the past, the answer was “no.” Today, the answer is “yes,” but only if you have spousal insurance coverage. This type of coverage is now available in New York State and you can get it from your automobile insurance company at fairly low cost. If you have spousal insurance as part of your automobile insurance policy, the coverage may help you to pay for pain and suffering and other damages caused by your spouse. To get all the insurance benefits you deserve, it is important that you have an attorney who understands spousal insurance coverage. Have you or a loved one been injured by an uninsured or underinsured driver in Queens? If so, contact our New York car accident lawyers today for information regarding your legal rights. To speak with an attorney, call (646) 647-3398 or message us online.